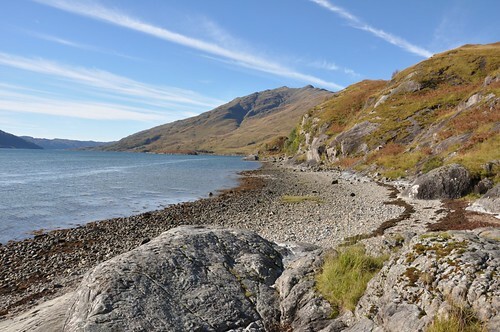 A five day backpack starting along the shores of loch Morar before venturing into the rough bounds of Knoydart. 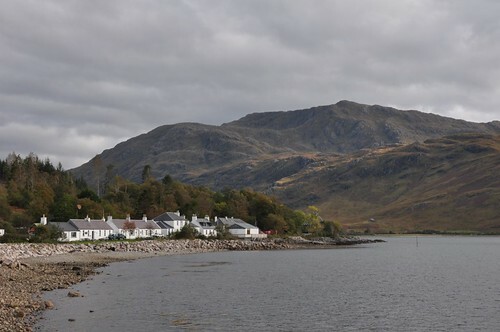 A ferry from Inverie to Tarbet across Loch Nevis almost completing the loop, just leaving the walk back to Bracorina and my starting point. 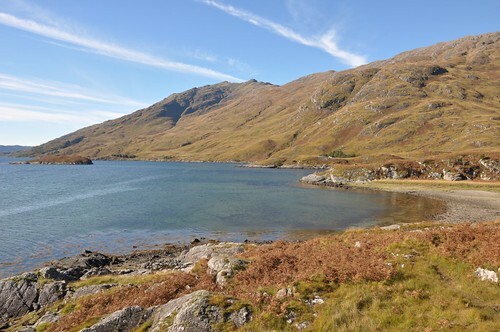 After turning off the road to the Isles at Morar it was a short drive down to the road end at Bracorina. 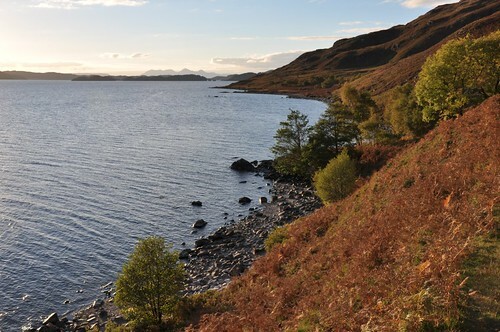 After packing recently bought food supplies and chatting to a couple who had returned from a walk along the loch shore I was on soon on my way. 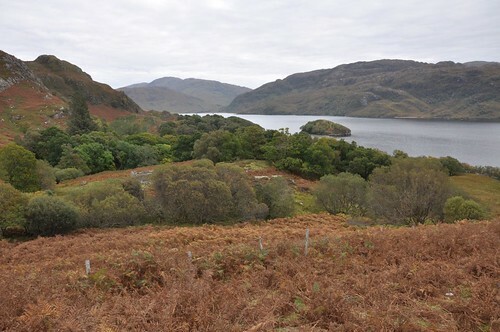 The track weaves up and down along the shore of Loch Morar on its way to its end at Tarbet. I resisted the temptation linger at some nice pebble beaches along the way wanting to make the most of the remaining hours before darkness. 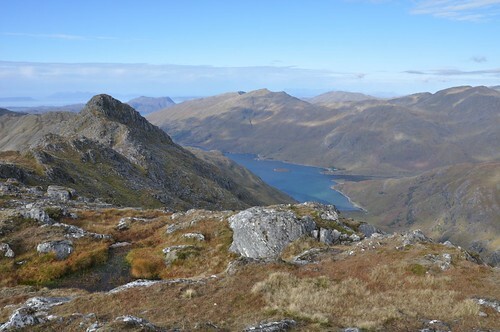 The track eventually climbs up over a pass before dropping to Tarbet and the shores of Loch Nevis. 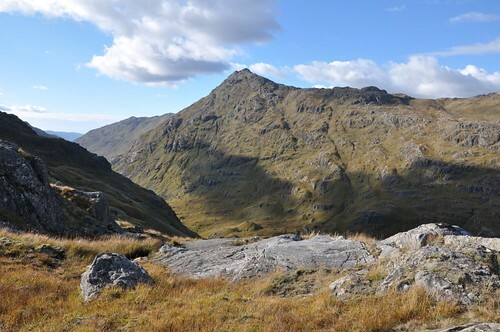 I left the pass at its high point near a large cairn and headed over to a style that allowed access to the fenced hillside. 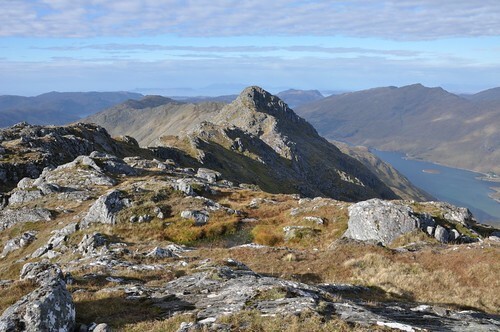 Although steep there were good footholds during the climb and after working my way through a band of crags and climbing another fence I was onto the ridge at Cnoc a’ Bhac Fhalaichte. 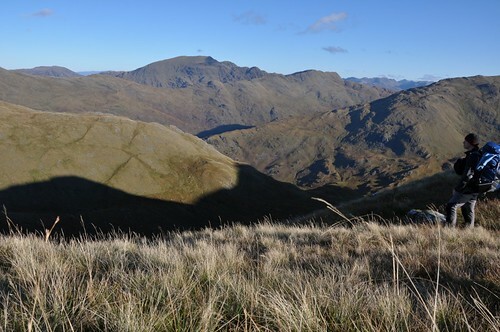 I was soon to learn that there would be very little travel along straight lines whilst negotiating the ridge. 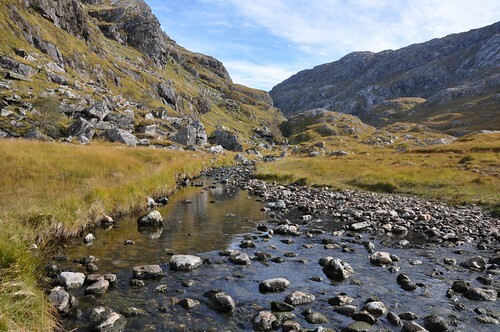 Avoiding the boggier parts I weaved my way around pools and lochans across Coire Dubh for the start of the climb up to Sgurr Mor. 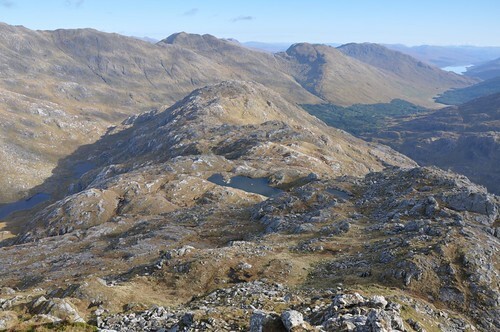 I was hoping for a camp spot up here but not finding a suitable place pushed on pausing occasionally to enjoy the views back down the ridge toward Mallaig. 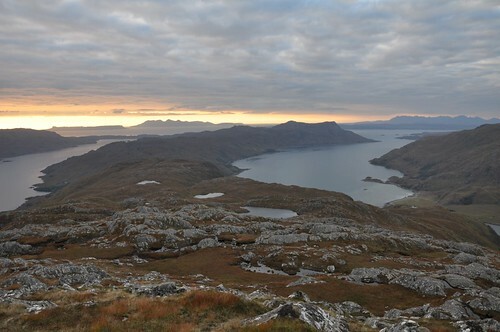 The sight of the small Isles floating in milky seas across the inner sounds would be a constant companion throughout my trip. 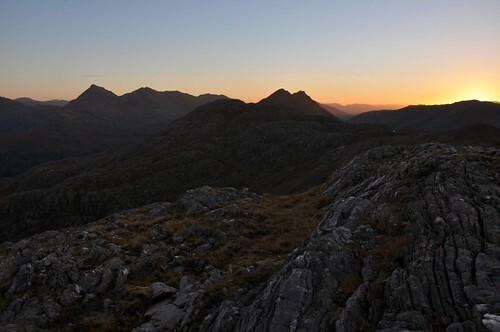 Dusk was fast approaching as I settled on a pitch near the remains of a low wall part way between Sgurr Mor and Sgurr Breac (NM835922). 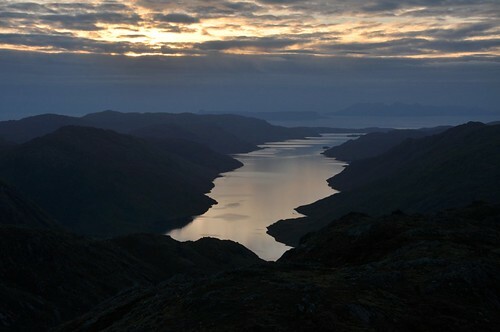 After unpacking I retraced my steps back toward Sgurr Mor to collect some water from one of the pools as the last of the light faded. 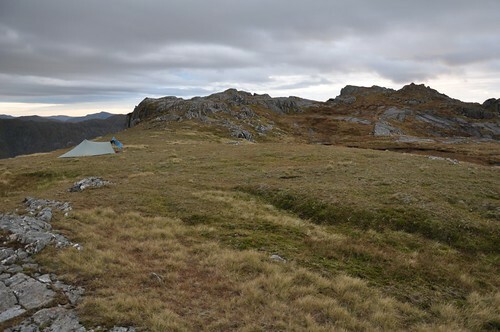 Another accompanying feature of the trip was to be the sound of rutting Stags and on this first night they quite often sounded almost outside the tent. 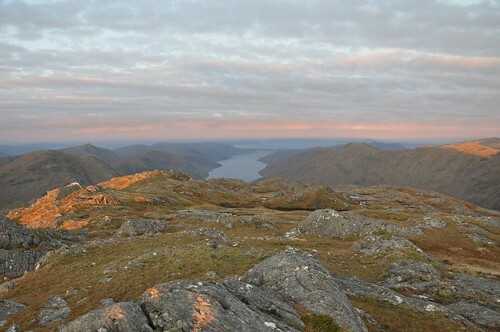 I was awake early and decided to catch then sunrise from Sgurr Beag. 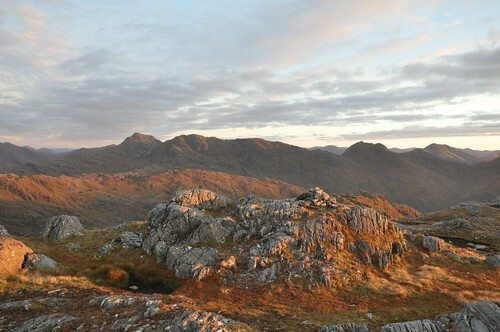 On reaching the top I lay the tent out to dry as I enjoyed a leisurely breakfast as the sun cast its early morning rays. The ground was a bit easier now for walking but the way was never really straight forward. The ups and downs and ins and outs provided a good amount of cover and I surprised many deer along the way. One or two Stags seemed a little reluctant when leaving theit possibly hard won territory and gave furtive glances back over their shoulder as they moved on. A later a trio of Ptarmigan held pose for a while before lifting to the wing. Over Sgurr na Ba Ruadhe the next high point was Sgurr nam Meirleach before dropping to a final col before the steep rise onto Sgurr na h-Aide. I had only recently replaced the feet on my walking poles and it was over this section that I managed to lose one. Despite stopping at the point where I thought it was lost there was no sign. This made for slightly awkward walking especially during descents when despite trying not to apply too much pressure the tip would occasionally sink deep into the ground. Bidein a’ Chabair was then reached after another 500m and bit more down and up but provided a fine viewpoint whilst enjoying an extended lunch. 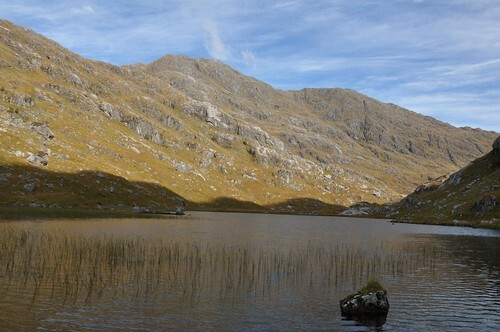 After eating and having a brew I dropped down rocky slopes to a lochan before continuing on along the ridge toward Druim Coire nan Laogh. 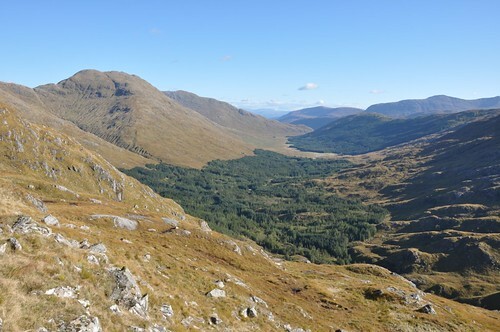 I pause before making my descent into the glen to watch a Golden Eagle cruising the skies above the higher slopes. 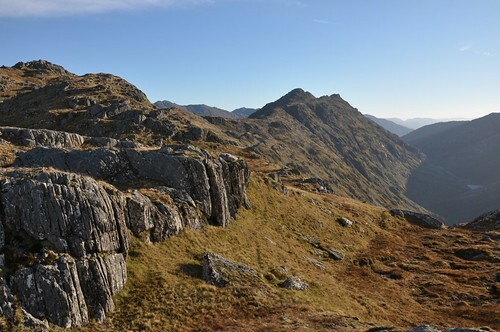 A few crags had to avoided as I worked my way downward. 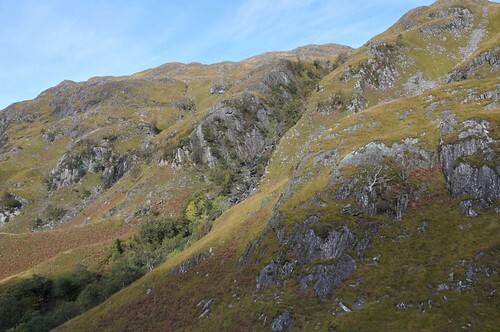 Having surveyed the hillside during lunch the ridge west of Allt Coire an t-Searraich looked like a good ascent route but I found it steeper than expected and lower down there was some deep vegetation to work through. The appearance of ATV tracks occasionally eased the way before suddenly disappearing. 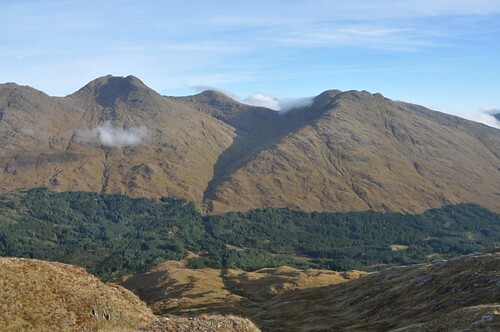 Once on the ridge proper however the way eased as I approached Druim a’ Choire Odhair. 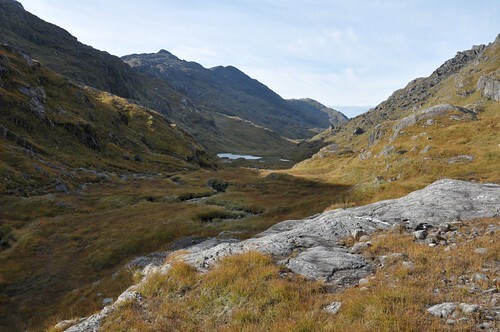 The ridge levelled here near some lochan’s and there were some good looking pitch sites. 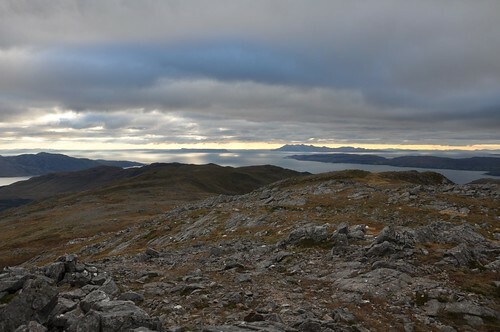 I spotted another walker nearing the top of Carn Mor from the east as I pushed onward. 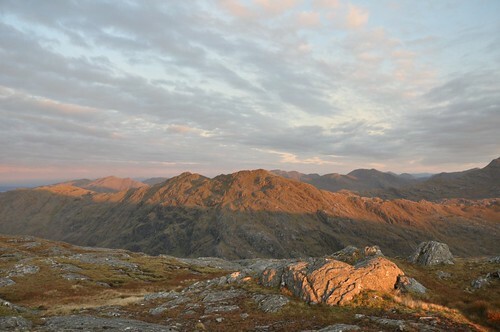 There was no sign of anyone as I reached the summit but given that it was late afternoon anyone not camping high would have had very limited time for their return journey. 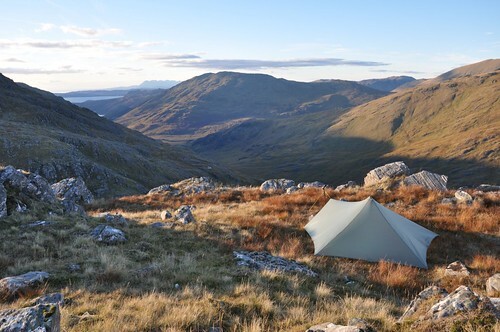 A quick wander around and I soon found a suitable camp spot. The tent pegs were not as secure as I would have liked in the mossy ground but given the benign conditions I was happy enough. 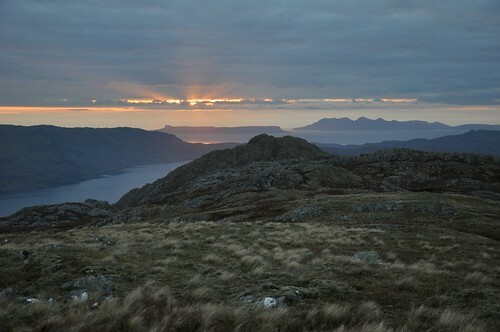 Camp set I headed a little west along the ridge to enjoy sunset over the length of Loch Morar. It was another cool night and the absence of any wind meant there was plenty of condensation on the flysheet in the morning. 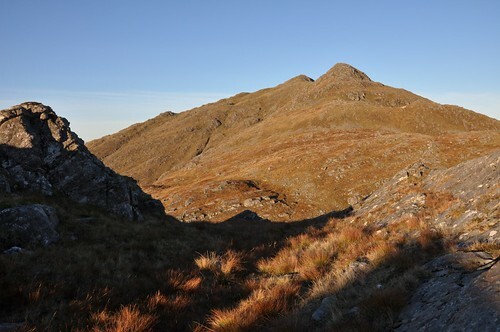 After enjoying sunrise and a bowl of porridge it was time to pack up and head off along the north eastern spur toward Meall nan Spardan. 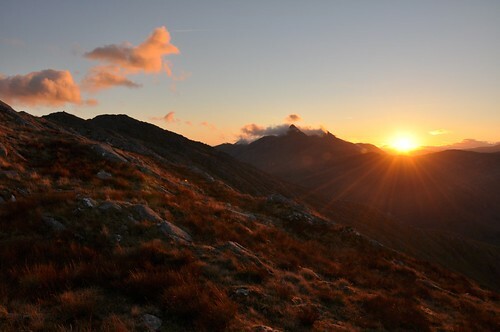 The sound of stags roaring echoed around the corrie as I started to feel the warmth of the rising sun. 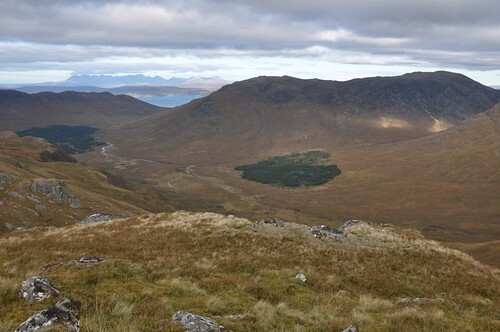 It was pleasant going along the ridge before I reached the drop off to Glen Dessarry taking a heading that would lead to an obvious fire break in the forest. After the occasionally slippery and boggy descent I found some rocky slabs to walk along before having to negotiate a fence at the break in the trees. 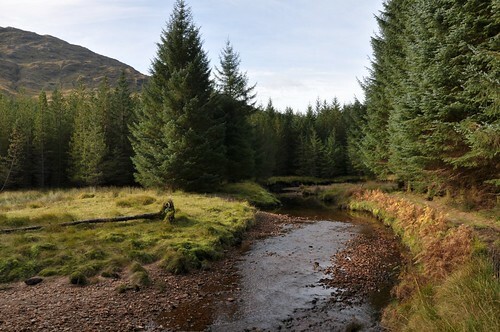 Soon after I found the river running low so it was an easy crossing to reach the forest track. The fragrant smell of pine accompanied me along the track, the ground was good initially but there were some boggier sections to be skirted round. The path started to rise before eventually leaving the trees on the edge of an area of grassy moorland sitting between two rocky ridges. The old path was good in places but longer sections of vehicle tracks proved very boggy going. 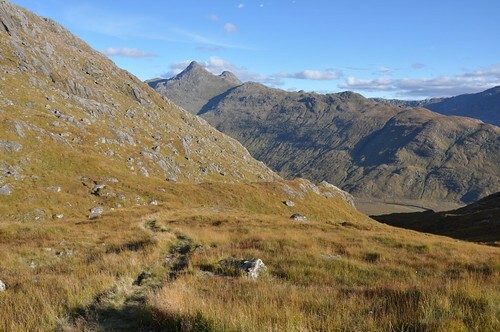 The long grasses hid the pathway completely at times but I eventually picked up a rather muddy line as the way began a steady descent toward Lochan a’ Mhaim. For the first couple of days my trail shoes had stayed remarkably dry but I think Wellington boots would have been the only footwear able to keep the water out over this section of the walk. 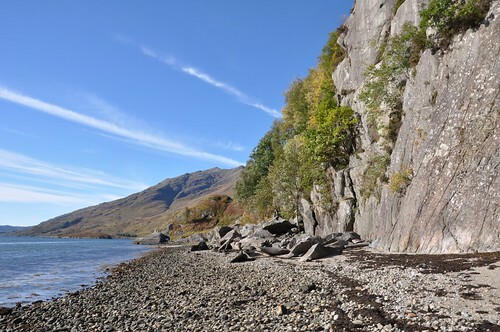 It had been a cool descent to the loch and it was nice to eventually escape the shadows as I approached Mam na Cloich’ Airde were I stopped a while to take in the rocky slopes of Druin nan Uadhag opposite. Shortly after the path detours uphill and slightly away from the river for a section to avoid a gorge further down. A bridge then allows crossing below the tree lined gorge of Allt Coire na Ciche. Returning to the banks of the Finiskaig River I was then back down at sea level at FinisKaig were Sourlies Bothy came into sight. It was now time for very welcome stop to have some soup and sandwich. 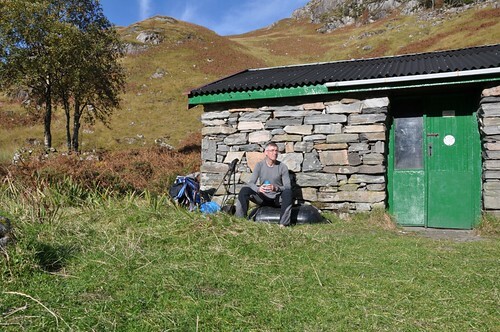 I sat outside the bothy soaking up the warm sun and contemplating what to do next. 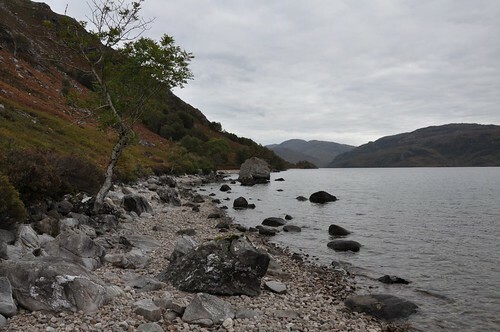 I was quite content and was very tempted to stop right there to just enjoy the surrounds on the shores of Loch Nevis. 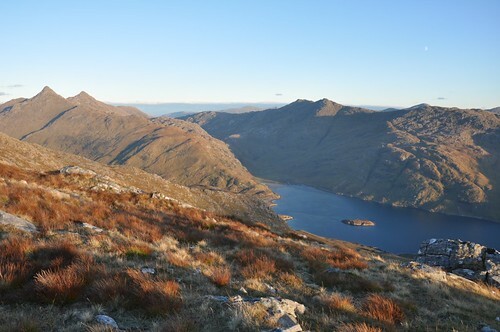 However I decided to keep to my rough plan and head up on to the hill dominating the view across the loch, Beinn Bhuidhe. 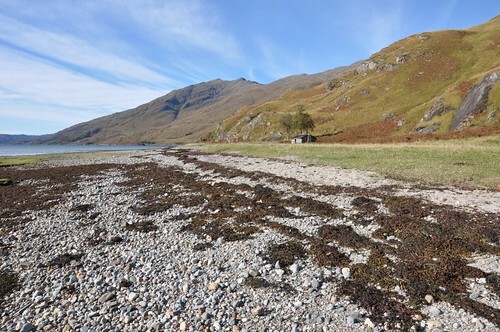 The tide was not out far enough to allow walking around the headland of Eilean Tioram so I took the short by pass path that leaves the beach and cuts the corner. 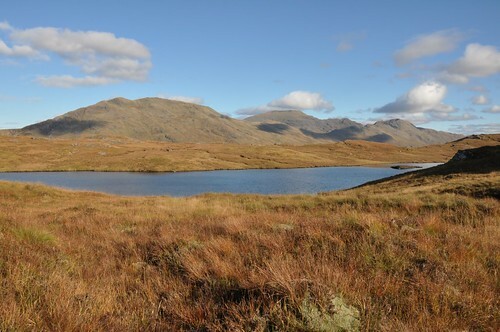 A couple of deer seemed unconcerned by presence as I made my way across the grassy flats toward Carnoch. I had not bothered checking the direction of the path during lunch and ended up following deer tracks on the opposite side of the plain. It was easy enough going until it all got a little tussocky as I neared the ruins. Feet already wet I decided to wade across the shallows to cross the River Carnach rather than detour along to the bridge. 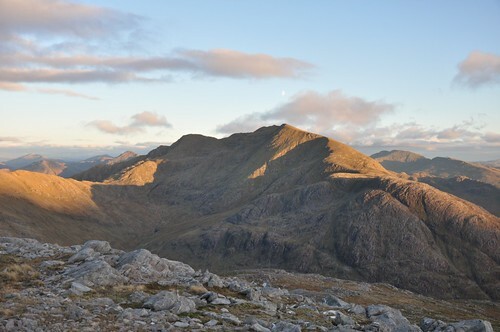 It’s a fine setting here and affords a grand view of the prominent peak of Sgurr na Ciche. 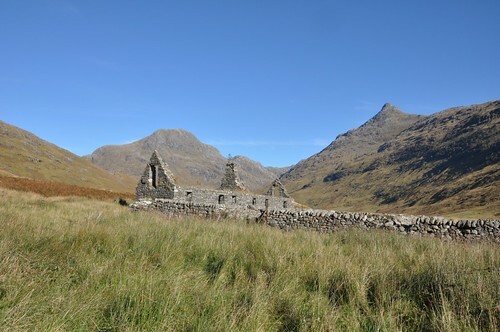 Ben Aden and its roughly hewn slopes also stands out at the head of the glen. A fine stalkers path leads from Carnoch to the top of the high pass of Mam Meadail and allows relatively quick access to the 550m contour. 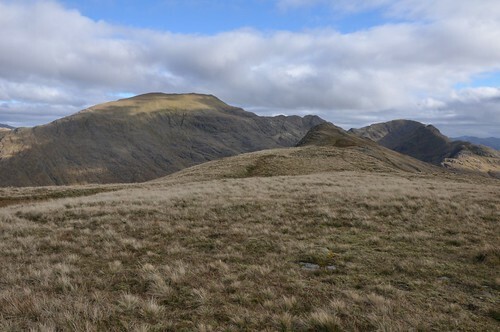 It was back to the rough ground as I headed onto the eastern end of Beinn Bhuidhe’s long ridge. 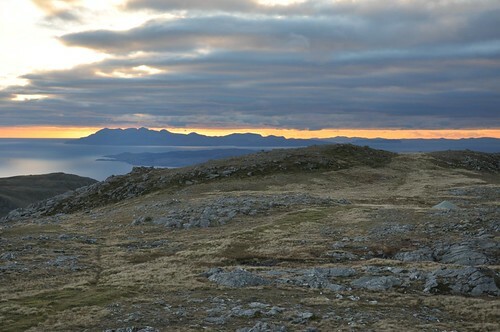 I was tiring a bit as I topped out on Meall Bhasiter and into the chilly wind. 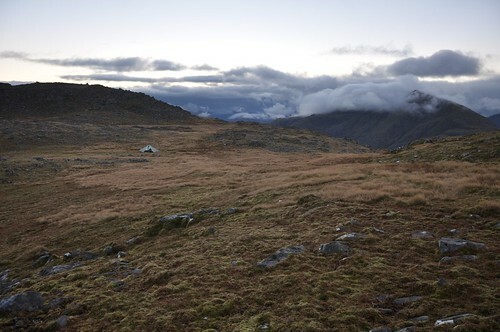 The light was already starting to fade but I pushed on passed a couple of likely camp sites. 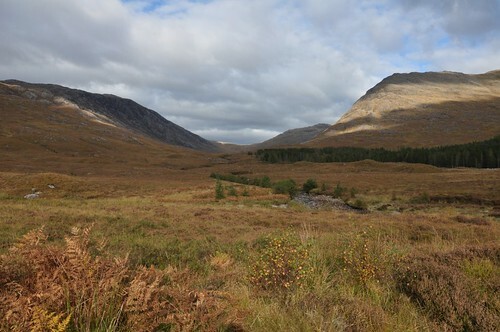 Shortly after I reached Mam Uchd and found a good sheltered spot not far from a good water hole. Camp set I retraced my steps to the lochan to filter some water. It was then, cook pot in hand, time for an improvised and rather reluctant ‘shower‘. Once dried and re-clothed I was feeling suitably refreshed and ready for my evening meal. Sunset was again a bit subdued but enjoyed non the less. 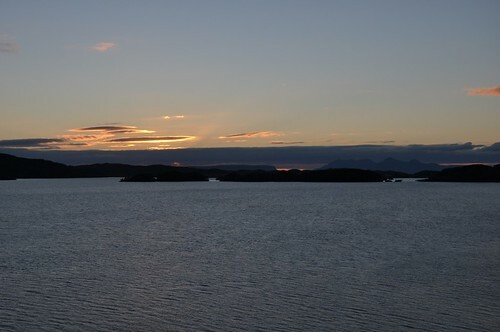 My luck was holding as far as the weather was concerned as it was another bright dawn that greeted me when getting up to watch the sunrise. There was still a cold wind blowing but once the sun cleared the shadows there was less of a chill. After a little drop to the col a steep climb onto the 802 top soon warmed me further. 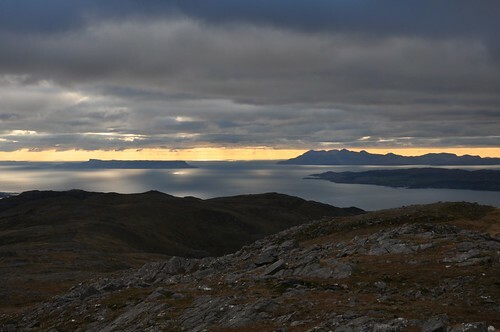 Another drop and a bit of a scramble and I was then on top of Beinn Bhuidhe with its fine views out to the small isles. Continuing along the ridge across Bealach Buidhe and onto Sgurr Coire nan Gobhar I took some time to try and pick a line down to Loch Bhraomisaig. 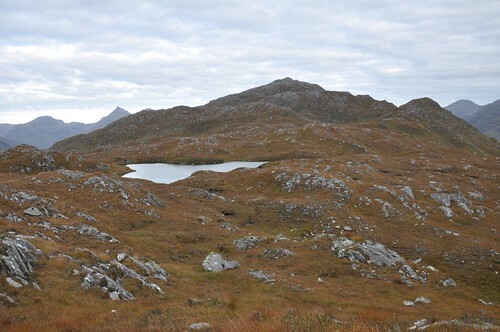 After following the ridge as it turned down to Sgurr a’ Mhadaidh-ruaidh I followed a line west along a vague ridge to eventually follow deer track between the two lochs and on toward A Chruach. It was a slightly awkward descent from here through long grass, heather and over tussocks and I was happy to reach the edge of Inverie village at Kilchaon. First job was to head to the Post Office to pick up some food and fuel for the stove. Restocked I then headed to the Café for lunch, the pub was closed as the landlord was away back to Belgium and would not be back until Christmas. Some seating at the back of the café allowed food to be enjoyed against the backdrop of Inverie bay. Again as at Sourlies it was a bit of an effort to get going again but I shouldered my now heavier pack and headed out of town. 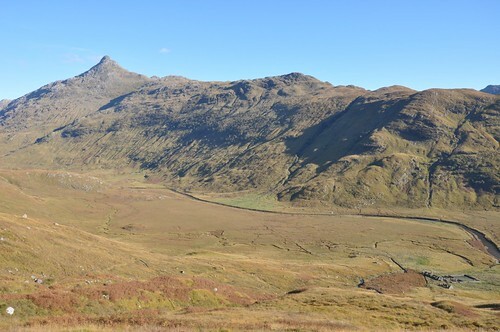 It was feeling warm again as I made my way along the landrover track to Mam Uidhe and on into Gleann na Guiserein. 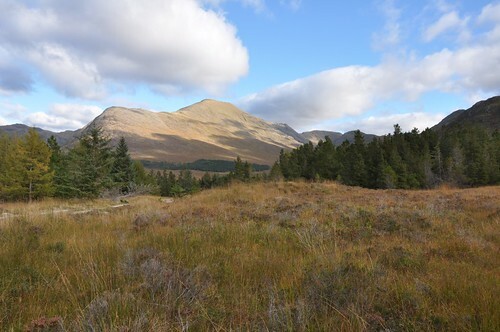 Ladhar Bheinn held my interest as I followed the forestry track but the stony southern slopes of my next goal, Beinn na Caillich were also in my field of view. 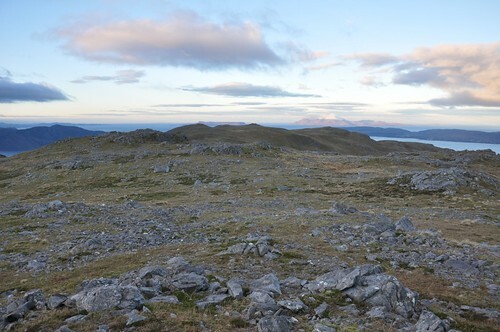 As I reached the point were Abhainn Bheag joins Abhainn Inbhir Ghuiserein I got a wave from some elderly campers as they prepared to leave what looked like a nice spot. After using the bridge near Folach I followed the river bank to pick up the path that heads up to Mam Li. 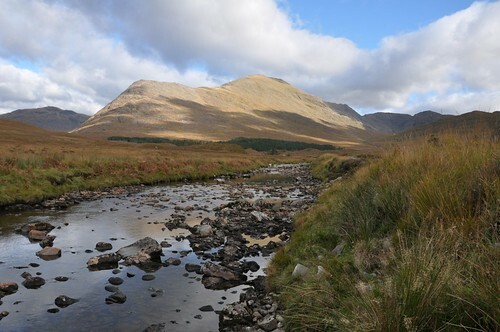 It was a good path for a long way before crossing the river and becoming less defined for a while. 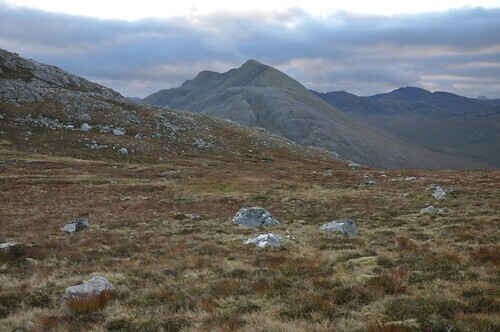 I left the path to pick up the east ridge but having to cross heathery ground with many part hidden boulders first. 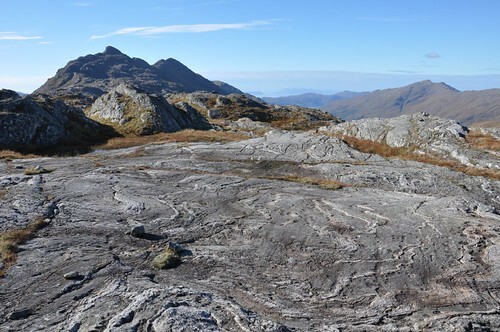 Sections of slab helped with the ascent as did the views back to Ladhar Bheinn. 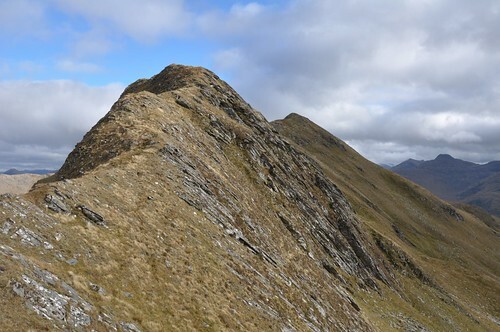 The ridge over Carn Dubh lead directly to the boulder strewn top of Beinn na Caillich. I didn’t linger as the wind had again rediscovered its bite. 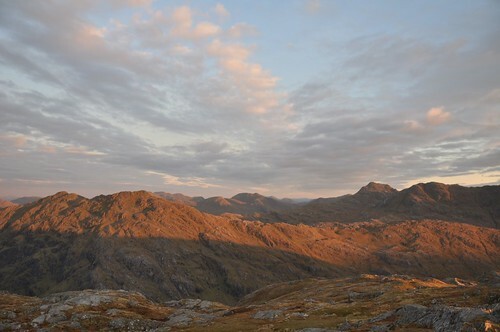 The light was again fading as I set up camp a short way from the top. I managed to locate water a bit further west although did have a drop a little way. 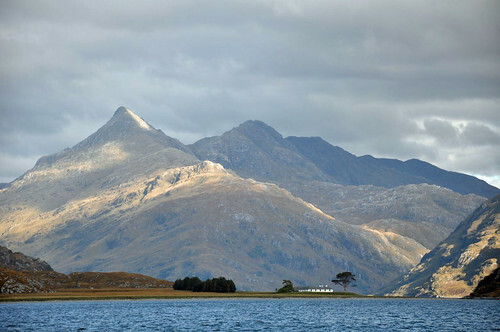 Again there were good seaward views on offer whilst there was the rather majestic Ladhar Bheinn landward. 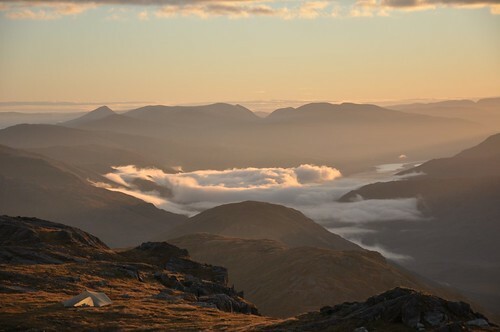 There was quite a bit of cloud cover over night and I awoke to a swirling mist in the morning. 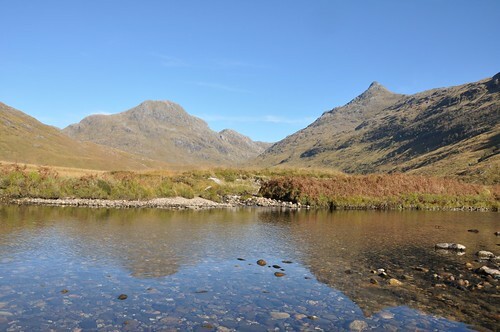 I had considered going over Ladhar Bheinn on my way to Sgurr Coire Choinnichean but wanting to catch the afternoon ferry didn’t feel I had time. 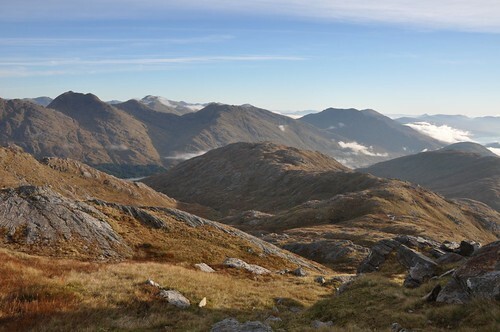 The mist had all but cleared as I left Beinn na Caillich heading out toward Meall Coire an t-Searraich. 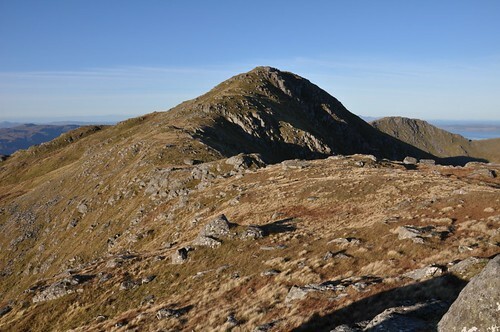 I followed the ridge as far as Creagan Dubh-choire at which point I turned down hill aiming to pick up my outward path a couple of hundred metres above the waterfalls. 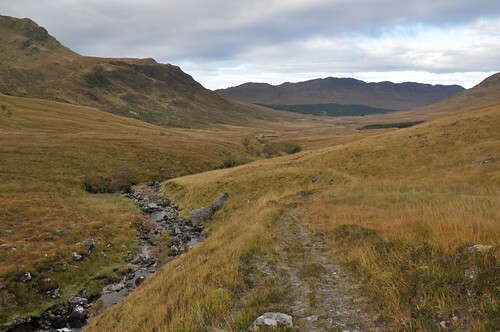 After following the path round to Folach I continued on up the glen but soon realised I was on the path heading up to Ladhar Bheinn. Checking the map I realised the path I wanted had somewhere branched off to follow Allt Coire Torr an Asgaill. Not knowing how good the track would be I decided to cut across country. 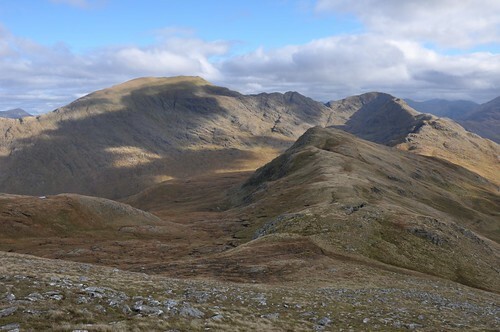 The stalkers path when I reached it was well defined and eased the rest of my way up into the corrie. 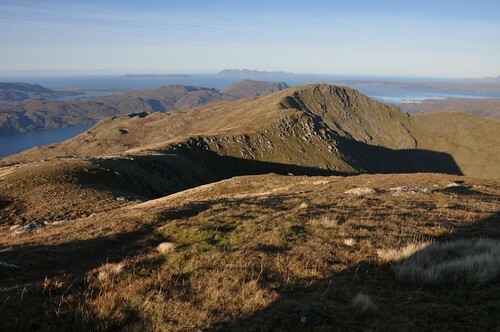 From here it was back to the rough going as I headed for a notch in the ridge at Mam Suidheig. After working through some peat hags a grassy rake led uphill. 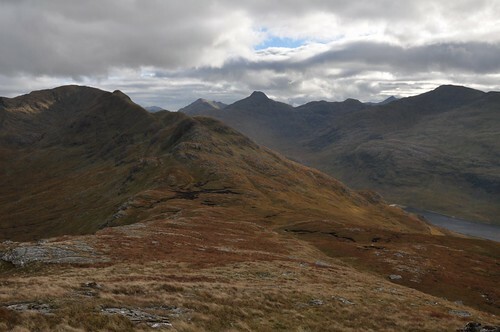 The ridge is well defined and it would have been nice to follow it all the way round from Ladhar Bheinn, maybe an option next time. 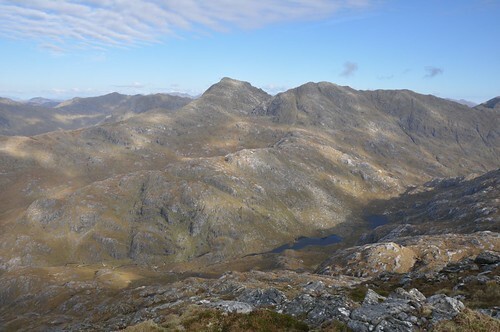 A steep climb soon had me top Stob an Uillt-fhearna before gentler slopes continued along to Sgurr Coire Choinnichean. I had made good time and realised I had plenty in hand to meet the ferry. 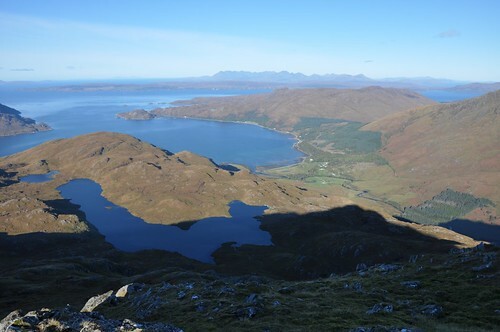 After a relaxed break overlooking Inverie I was just about ready for the steep descent. 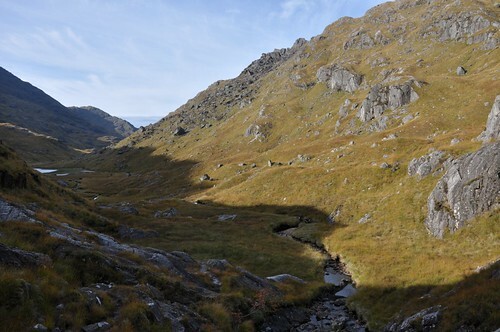 The path leads down a fine narrow ridge to reach a flat grassy area before rounding the head of the gorge carved out by Allt Slochd a’ Mhogha. 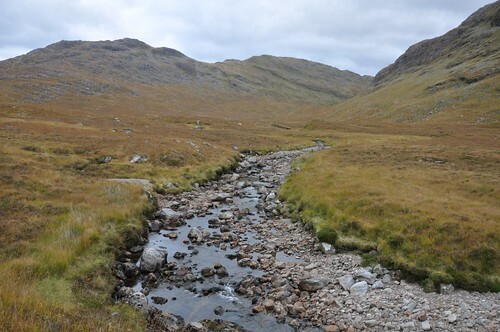 The way continued down the west side of the burn before traversing the hillside to enter the forest above Inverie. Back in the village I had time enough to revisit the café for a tea and bite to eat. 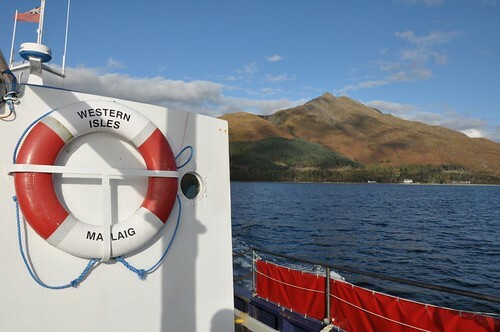 The MV Western Isles dully arrived and I boarded for the crossing to Tarbet. The sun was out again and I stood out on deck enjoying the views and surveyed much of the ground I had covered over the last few days. 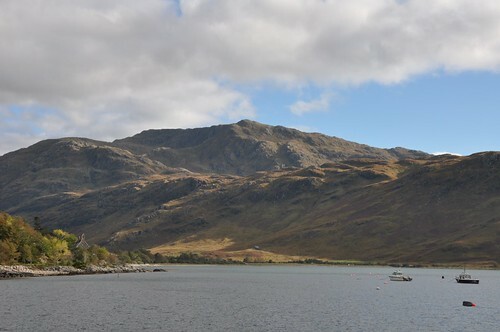 The standout peak from the sea was Sgurr na Ciche and despite the slight haze it looked magnificent rising above Kylesknoydart. 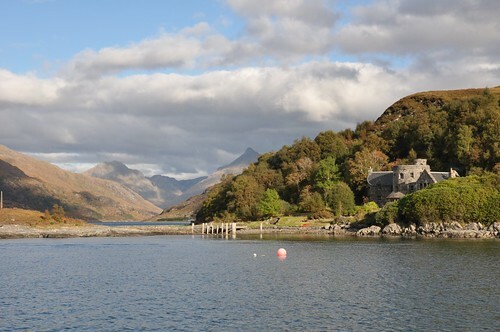 A small dingy is used to take passengers ashore at Tarbet and on this trip there was just me and the post. 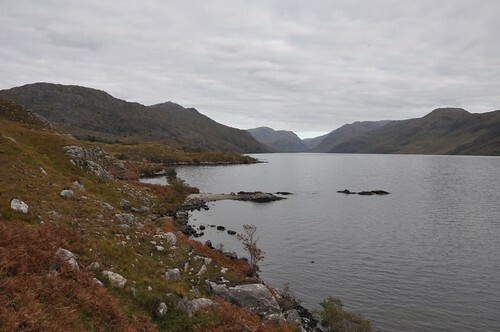 The various places named Tarbe(r)t derive from Gaelic tairbeart ‘portage’, a neck of land across which boats could be carried. 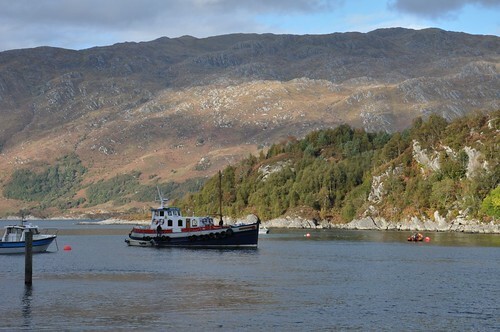 For me there was no boat just my rucksack as I made passage from the shores of Loch Nevis to those of Loch Morar. 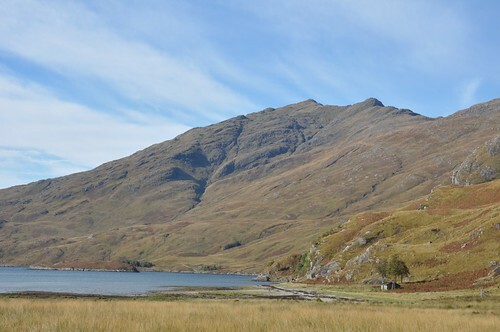 Now all that remained was the last few long miles back along the side Loch Morar to journeys end at Bracorina. I soon passed the small cottage at Swordland before weaving along the waters edge to the ruins at Brinacory.